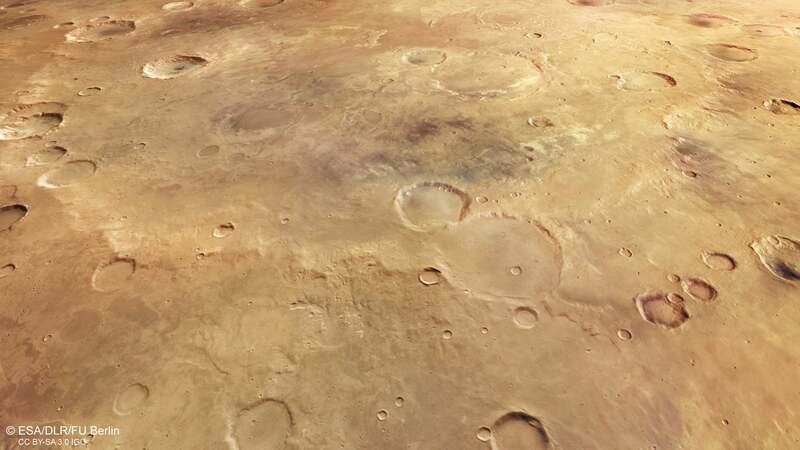 The European Space Agency's Mars Express orbiter has used its High Resolution Stereo Camera (HRSC) to make a mosaic image of Greeley Crater on Mars. The crater, 284 miles in diameter, is named for Ronald Greeley, a longtime planetary geologist at Arizona State University. Greeley, who died in October 2011, began teaching at ASU in 1977. He was a member of the science teams of NASA's Viking mission to Mars and the Voyager mission to the outer planets. His specialty was terrestrial field geology and the photogeologic study of volcanic, impact and wind-related processes on Earth, Earth's moon, Mars, Venus and the moons of the outer planets. He also had extensive experience making geologic maps from planetary images and led the team that creatied the eastern hemispheric geologic map of Mars from Viking data. Along with ASU meteoriticist Carleton Moore, Greeley helped build a world-renowned planetary geology program at ASU in the 1980s and 1990s. That program helped form the centerpiece of ASU’s School of Earth and Space Exploration (SESE), for which Greeley laid the groundwork. Along the way, he brought to ASU one of NASA's Regional Planetary Image Facilities. Now named for him, it is currently under the directorship of geologist David Williams, associate research professor at SESE. “Ron Greeley was a great mentor," Williams said. "He was always there for discussions of science, science policy, reviewing drafts of papers, and supporting colleagues, students and postdocs." The mosaic image of Greeley Crater from the HRSC on Mars Express was assembled at the German Space Agency's Institute for Planetary Research in Berlin. The Planetary Science and Remote Sensing working group at the Freie Universität Berlin used the data to create the mosaic. Greeley Crater lies in Noachis Terra in the southern highland of Mars and is between two large impact basins, Hellas Planitia and Argyre Planitia. While the crater is 284 miles (457 kilometers) in diameter, it is only about 5,000 feet (1,500 meters) deep. A person standing on Mars in the crater's center would probably be unaware of being inside an impact crater. With an age of up to 4 billion years, Noachis Terra is among the oldest regions on Mars. Over billions of years, numerous impact craters of various sizes have formed, altered and eroded the terrain. During this degradation process, once-fresh impact craters turn into shallow, low-relief depressions by erosion through wind, water and ice over time. The absence of visible ejecta, low or missing crater rims and the flat crater floor, as well as the many later impacts marking its surface, suggest a very ancient age for Greeley Crater. "Ron’s colleagues at ASU are much honored with this HRSC mosaic of Greeley Crater on Mars," Williams said. "We have placed a rendition of the mosaic in our newly renovated Ronald Greeley Center for Planetary Studies, located in Bateman Physical Sciences F-Wing."